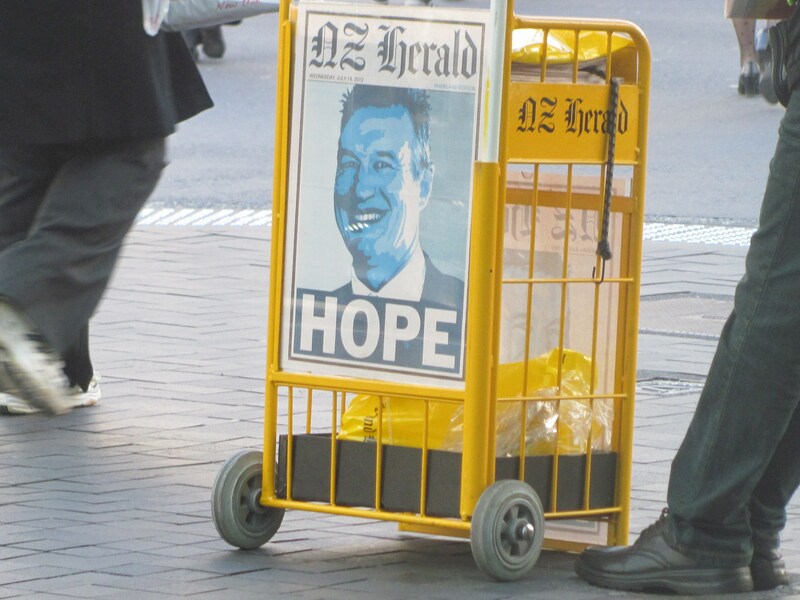 The advertising sheet for today’s newspaper in Auckland made me laugh. Who is this figure who is supposed to give hope? Some politician who’s going to usher in a new era of prosperity? Some religious leader inspiring hope and faith in believers? Nope, this is New Zealand, he’s the guy who’s just been named coach for our Rugby team next season. John Kirwan was named yesterday as the coach for the Auckland Blues in the Super Rugby competition. To be fair to John Kirwan he’s actually done a lot to use his fame as a former All Black for good – he’s been the face of several Mental Health campaigns and has done a lot of work raising awareness about depression. Add that to the fact that The Blues have REALLY sucked this year you can almost understand the Obamaesque poster, almost. On a completely unrelated note have I mentioned lately how much I love The Bloggess? Wanting a pony called Pony Danza so she can sing ‘Hold me closer Pony Danza’ is GOLD! This entry was posted in Uncategorized and tagged auckland blues, john kirwan. Bookmark the permalink.